Hazels kittens born 14.12.2014 some fotos later on..
Time goes so quickly and now after 1 year the kittens are adults. 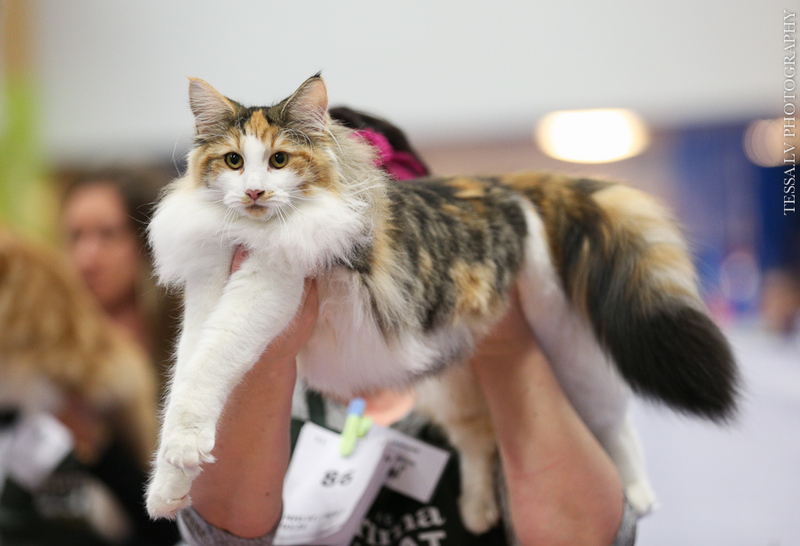 They have fine homes and have been in the show as kitten and adult classes. All 3 kittens has been BIS , result in Best in Show. Only Tiffanie has been at show two times. She is a neuter. Rikke has been neured after the litter .She is 5 years old now and one litter is more than enough. We WAIT KITTENS ON THE 28th of MARCH. 5.12.2016 We hope that we have NFO kittens next year. 4.12.2016 Hazels daughter has been under year 2016 many shows and been Best in Show female and has titel Baltic Winner. She is a beautiful female. 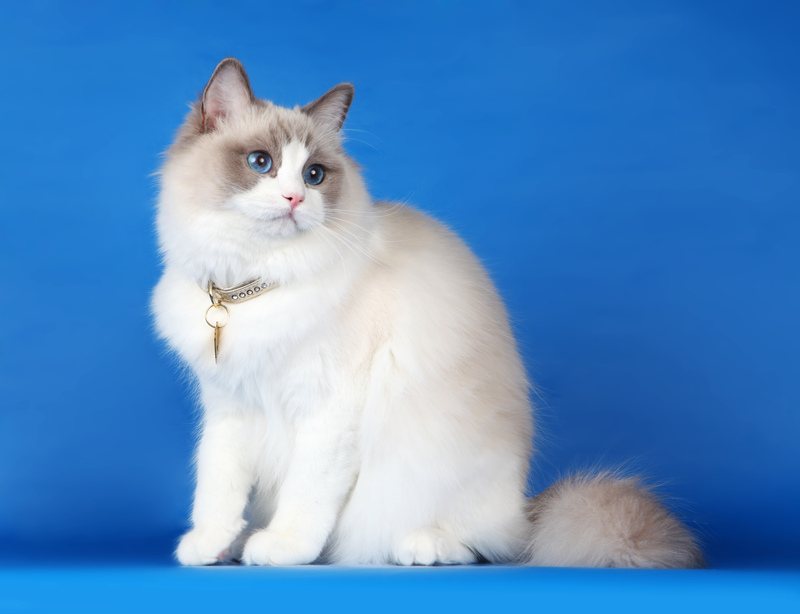 Hazel son Sulo , from same litter as LIly is a hansome male . He has very good body lenght and very nice head and profile and beautiful eyes. Time has gone and we have been many shows under last years. In the house no kittens but a new cat has moved in to our house. 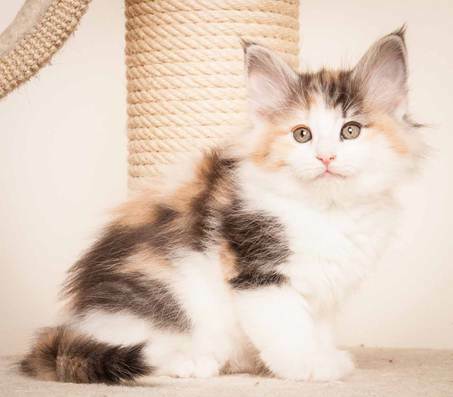 She is from Norwey and from the same cattery as Rikke Her name is Migoto´s Embla . Back tortie with white. 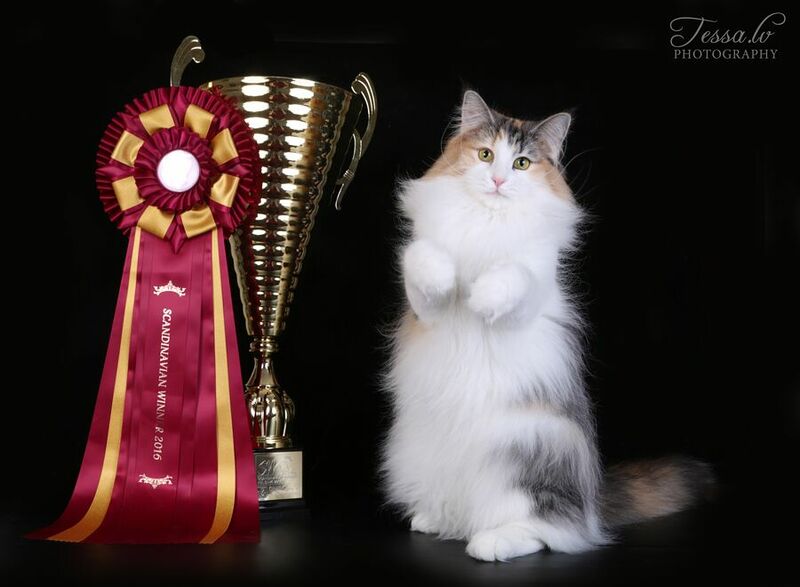 She has been at the shows many time and she is now International Champion. She is a female of full off life. Now 18.3.2015 Hazels babies are moved to their new homes. I am happy Lily and Sulo have so super nice families both. 14.3.2015 SC N*Migoto´s Rikke DVM was in Rika Latvia Best in Show female. IC N*Diadem´s Hazel Harmonie RAG a 03 ja isä Neige-Cristal´s Mon Tresor Florian RAG n 04. Show in Tallinn 3-4.5.2014 Rikke was BIV, Nominated and Best in Show female both days with all votes. Show Turku 5-6 April Rikke had her Cagcib, BIV NOM. on Sunday Cagcib, BIV , NOM and Best in Show female. 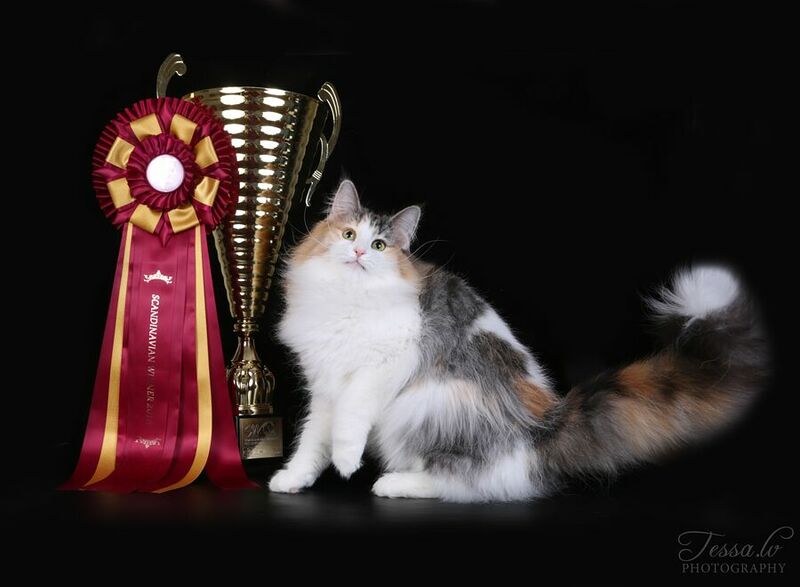 IC N*Migoto´s Rikke JW had in Kokkola Show 15 of March 2014 Cagcib , BIS Best in Show female. CH N*Migoto´s Rikke JW in Riga on the 8 and 9 March 2014 Cacib, Nomaination to Best in Show. 3 poikaa ja 1 tyttö. WE HAVE KITTENS; BORN on the 8 February. 3 boys and 1 girls. 25-26.1.2014 SUROK show CH.N*Migoto´s Rikke had CACIB and was NOM to Best in Show on both days. 2.1.2014 Darlinlildolls Melania odottaa pentuja helmikuun alussa. 24.11.2013 Turun näyttelyssä Migotos Rikke JW oli EX1,CAC, BIV ja NOM paneliin. 24.11.2013 Migotos Rikke JW on the 24 November EX1, CAC, BIV and NOM to the Best in Show. Migoto´s Rikke JW on the 9th of November in ERY-SYD show , show results EX1,CAC . What a big surprise for many persons. Migoto´s Rikke JW on the 13th October in URK show , her 1 time as adult class 9 , results EX 1, CAC, BIV,Nomination and Best in Show female. Pascal first time in the competition URK cl 3-6 . Results EX 1 and nomination to Best in Show. He has super temper. He behaved very well and correct. Jade has moved to my sons house as a familymember. Garcon has moved to Tampere . His new family is very fine and I thank Marja and the family for taking care of him so full of love and care.